Often called a post-modern author Aritha Van Herk is an experimental writer who always pushes the boundaries of genre and gender. Her first book, Judith, won a major first novel award (1978) and brought Van Herk international recognition when she was still 24 years old. Aritha Van Herk was born (1954) in the town of Wetaskiwin (south of Edmonton) in Alberta. Her parents were Dutch immigrants who had just moved to Canada. She grew up in a Scandinavian community conscious of ethnic differences and English Canada. At the University of Alberta she earned a B.A. in English (1977) and began to write short stories. She went on to complete an M.A. (1978) in creative writing working under novelist, Rudy Wiebe also at the U. of A. She married geologist, Robert Sharp in 1974. 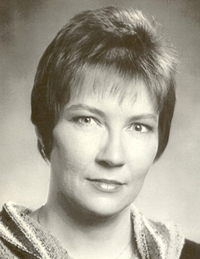 Van Herk joined the English department at the University of Calgary in 1983 and was appointed professor of literature and creative writing in 1991. Judith won the Seal Books (Canada) First Novel Award ($50,000) and was translated and published internationally. The heroine, Judith, is a young woman who deals with identity and stereotyping issues by leaving her secretarial job in the city and becoming a pig farmer. Feminist questions come into conflict with sexual relations and mark a pattern that Van Herk visited in later novels. In her second novel, The Tent Peg, the young protagonist disguises herself as a man to be hired as a cook for a geological survey team working in the Far North. Van Herk returns again to the north in the next novel, No Fixed Address: an amorous journey (1986). Here the heroine, Arachne, is a travelling saleswoman who likes the freedom of escape and sexual relations with different men. With Restless (1998) the travel is in the form of memory and meditation as the heroine spends her last day with the man she has hired to kill her. Aritha Ven Herk has experimented with non-fiction in Places far from Ellesmere: a geografictione: explorations on site (1990), a blend of travel book, autobiography, fiction and criticism. This hybrid genre continued with two collections of essays: In Visible Ink: Crypto-fictions (1991) and A Frozen Tongue (1992). In addition to her writing which has been translated and published in different languages, Van Herk has mentored and encouraged many younger writers such as Peter Oliva, Hiromi Goto and Tom Wharton.